Laurits Andersen Ring (1854–1933), View of a Shore with the Artist's Wagon and Tent at Enö (1913), oil on canvas, 40 x 61 cm, Nationalmuseum, Stockholm, Sweden. Wikimedia Commons. Laurits Andersen Ring (1854–1933), like his long-time friend HA Brendekilde, turned more to landscape painting in the middle and later years of his career. With the birth of his son in 1902, Ring moved his family to the old schoolhouse in Baldersbrønde, to the west of Copenhagen, where his wife Sigrid later had their third child. Laurits Andersen Ring (1854–1933), Old Outhouse (1907), oil on canvas, 43 × 40 cm, Private collection. Wikimedia Commons. 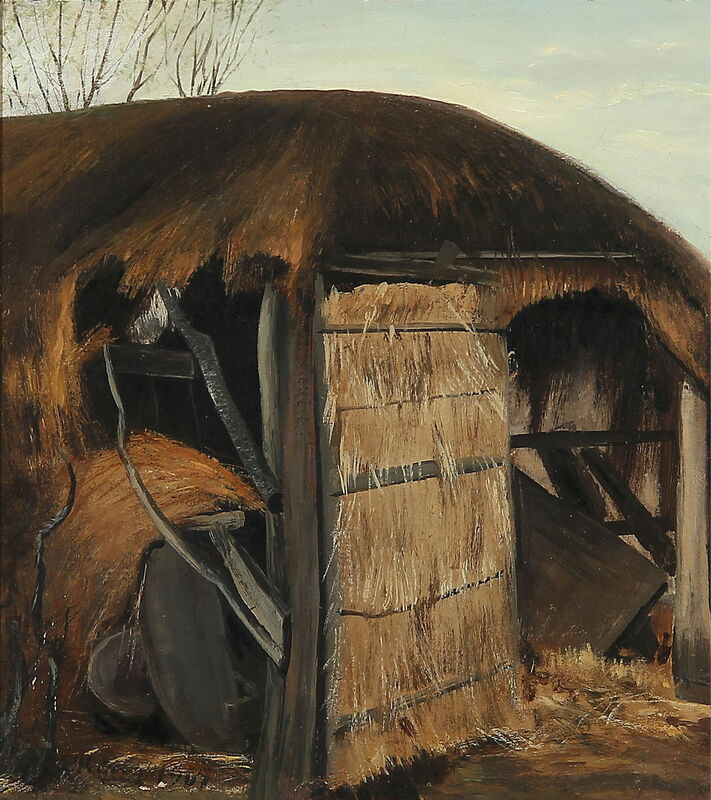 Ring’s style remained quite tightly realist, although this rendering of an Old Outhouse from 1907 is more sketchy than his exhibition works, and appears to have been painted quite quickly, probably in front of the motif. Whitewashing the Old House from 1908 is probably his most famous work from the twelve years that he lived in Baldersbrønde. 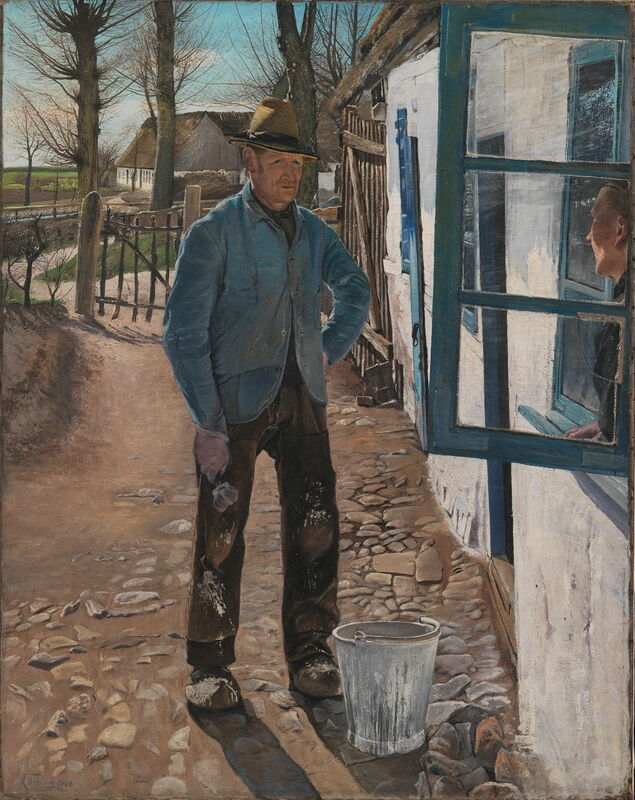 It shows a local man in the midst of applying whitewash – normally made from slaked lime rather than a proper paint with pigment – to the walls of this thatched cottage. He has paused in his work as the woman who lives there talks to him. The trees in the distance are still leafless, showing that it is early spring. The gate, path, and everything around them are resoundingly rustic. 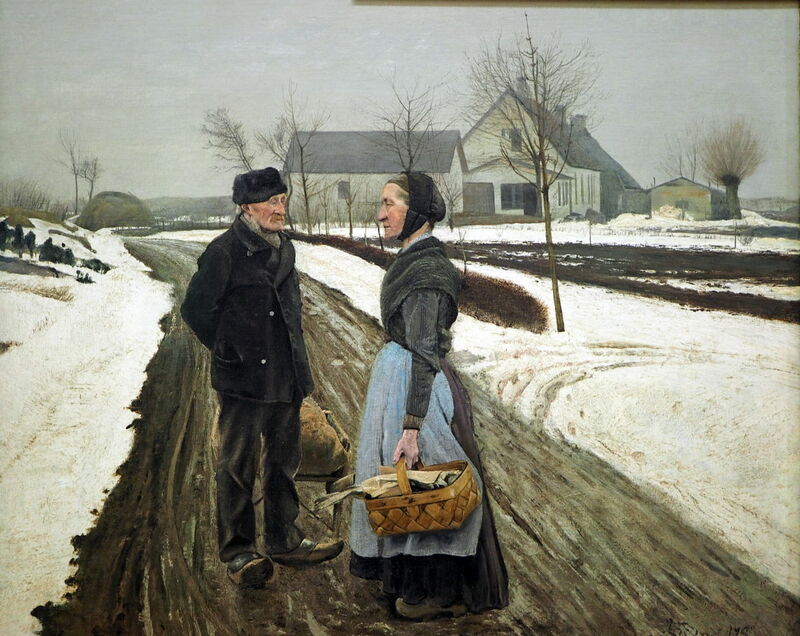 Laurits Andersen Ring (1854–1933), Short Stay (1909), media not known, 82 x 97 cm, Niedersächsisches Landesmuseum Hannover, Hanover, Germany. Wikimedia Commons. It was probably in the following winter that Ring painted Short Stay (1909), an enigmatic work. An elderly man and woman face in opposite directions: he looks to the right, she to the left, but their gazes do not meet. They both appear to be standing still, and in silence. He is towing a small sledge on which there is a sack; she is carrying a basket in which there is a large fresh fish wrapped in paper (I think). 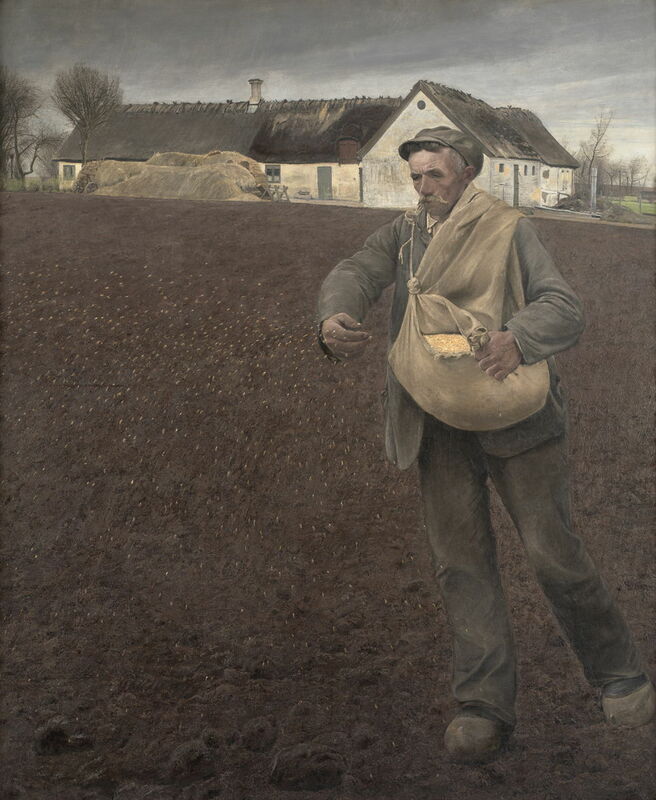 Ring had long admired the social realism of Millet, and would undoubtedly have seen his famous painting of The Sower, probably in its original version from 1850, and he may also have seen Vincent van Gogh’s painting from 1889. In 1910, he painted this, The Sower, in such great detail that you can see every seed frozen in mid-air. This suggests that he may have been influenced by photography, which was the first means of producing such images. Four years later, his friend HA Brendekilde painted his own interpretation of the same theme, which I showed in yesterday’s article. 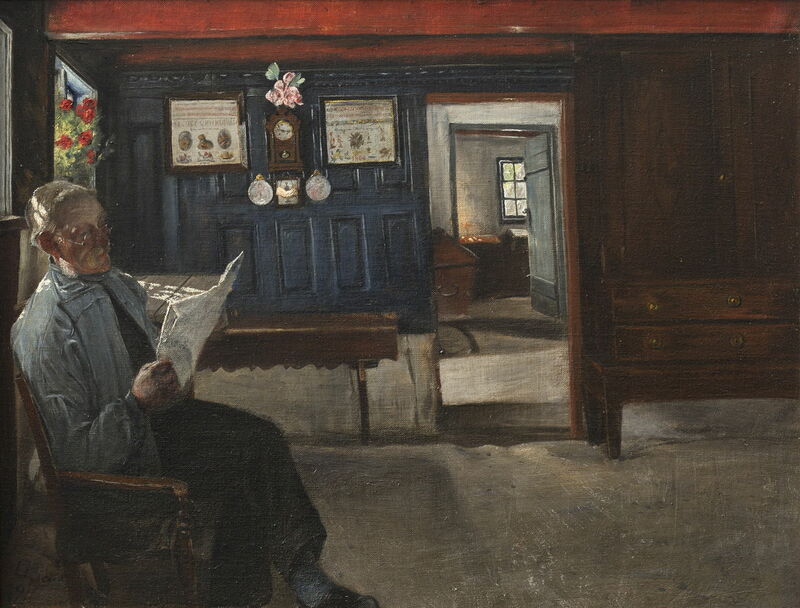 Laurits Andersen Ring (1854–1933), Interior with a Farmer Reading a Newspaper (1911), oil on canvas, 46 x 60 cm, Statsministeriet, Copenhagen, Denmark. Wikimedia Commons. Interior with a Farmer Reading a Newspaper from 1911 contrasts with the action of the sower and his flying seed, in one of Ring’s most glacially static paintings, which uses extreme asymmetry too. A farmer, better-off than the average peasant for sure, sits reading the newspaper by the light streaming in from its windows. Roses provide a brilliant splash of colour to the far left, and there is a clock ticking on the wall. The open doors lead through into the far end of the house, which is sparsely furnished by heavy wooden items like a wardrobe and a chest. Laurits Andersen Ring (1854–1933), The Artist’s Wife with the Family Caravan (1911), oil on canvas, 39.5 x 60.5 cm, Statsministeriet, Copenhagen, Denmark. Wikimedia Commons. By 1911, Ring and his family had bought a caravan, which in those days resembled a railway goods wagon and usually weighed several tons. Most had to be towed by a truck or even a traction engine, which were still used on farms, and were barely mobile. 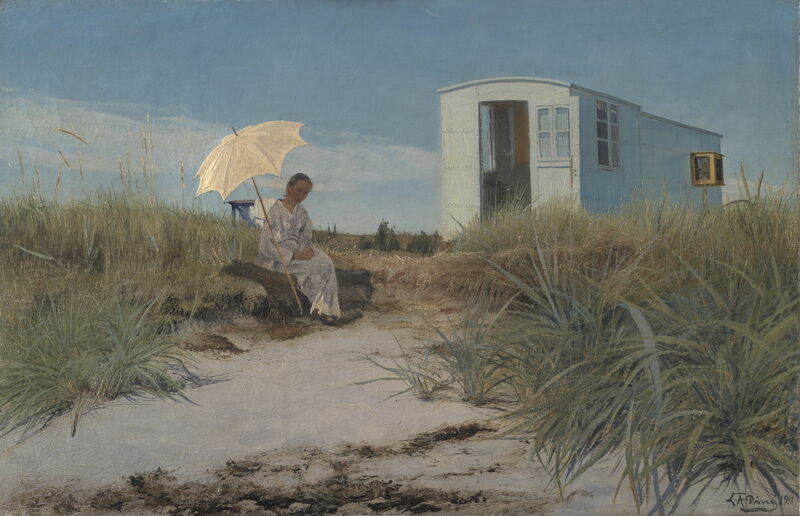 The Artist’s Wife with the Family Caravan (1911) shows Sigrid in a loose-fitting dress, under the shade of a parasol, enjoying a holiday amid sand dunes, perhaps on the coast of Sjælland (Zealand). There is no sign of their children, though. Laurits Andersen Ring (1854–1933), By the Village Pond at Baldersbrønde (1911), oil on canvas, 50 x 63 cm, Private collection. Wikimedia Commons. 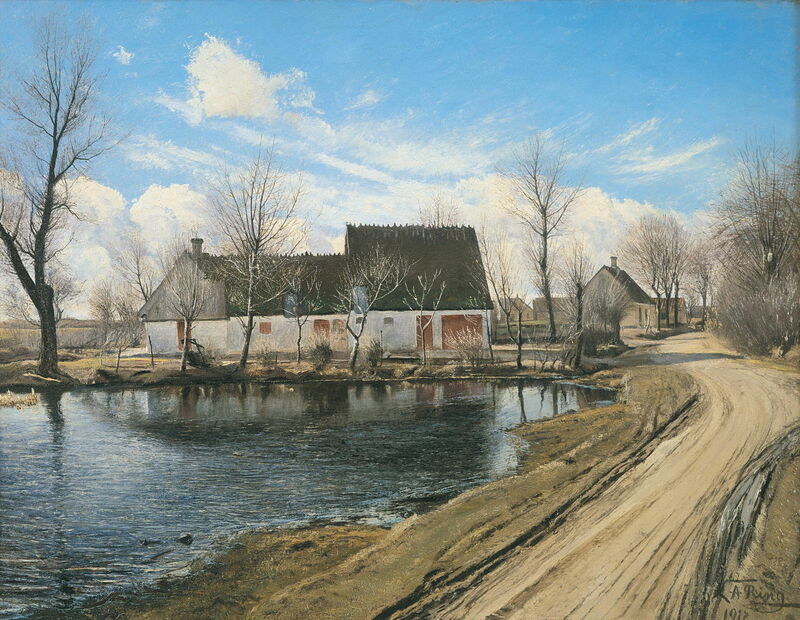 By the Village Pond at Baldersbrønde from 1911 shows the village in which the Rings lived, with its rutted mud track, once again in early Spring when the pollards are still bare of leaves. 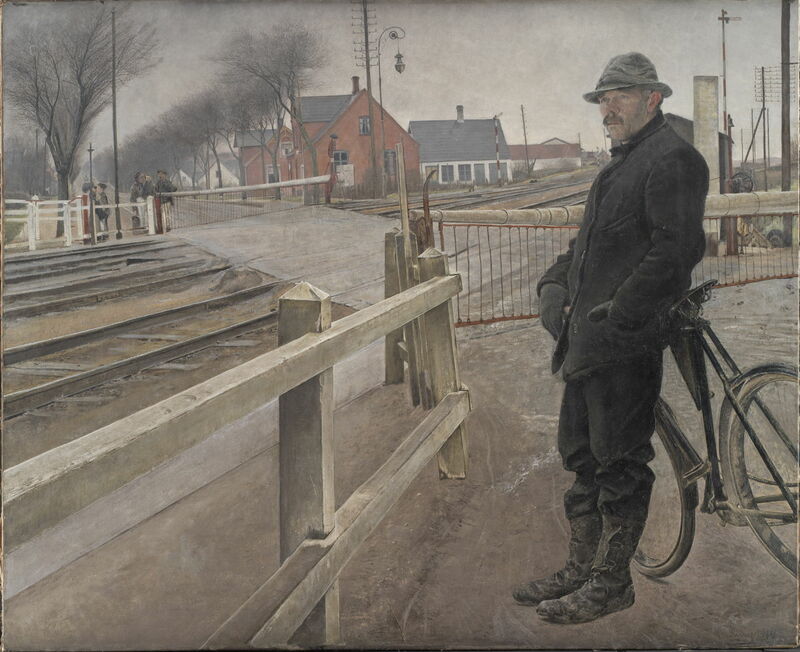 Laurits Andersen Ring (1854–1933), The Bridge at Karrebæksminde (1912), oil on canvas, 69.5 x 132 cm, Statsministeriet, Copenhagen, Denmark. Wikimedia Commons. Ring also returned to the country around Sigrid’s family home near Næstved. 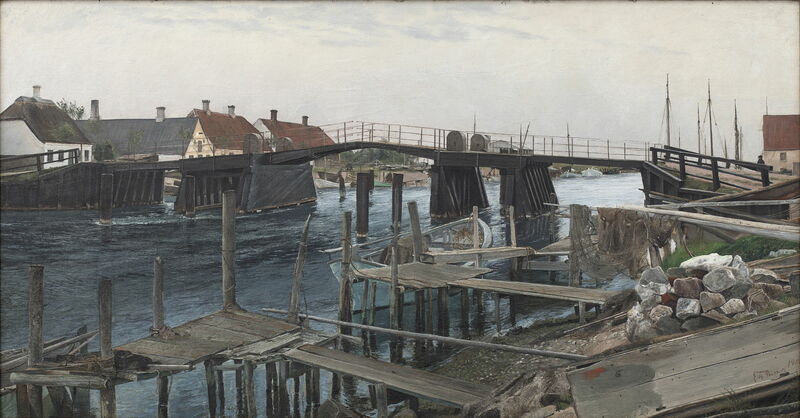 The Bridge at Karrebæksminde from 1912 must be one of his most intricately detailed works, showing the bridge connecting the large and populous island of Sjælland (Zealand) with the tiny rural island of Enø. This canal was dug in the early nineteenth century to connect Karrebæk Fjord with the Baltic, and has a very strong tidal stream, as demonstrated here. 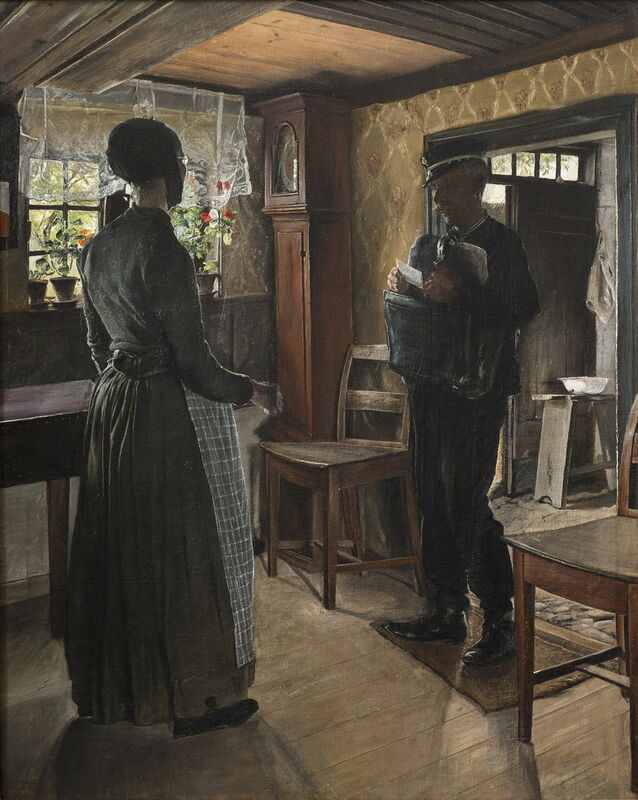 Laurits Andersen Ring (1854–1933), The Postman Comes with Letters (1912), oil on canvas, 103.5 x 83 cm, Statsministeriet, Copenhagen, Denmark. Wikimedia Commons. The Postman Comes with Letters from 1912 is another interior showing everyday life, with a country postman delivering letters to a woman in her cottage. The grandfather clock behind them is full-size, and must have been a family heirloom. Laurits Andersen Ring (1854–1933), View of a Shore with the Artist’s Wagon and Tent at Enö (1913), oil on canvas, 40 x 61 cm, Nationalmuseum, Stockholm, Sweden. Wikimedia Commons. In the summer of 1913 Ring and his family must have holidayed in their caravan again. 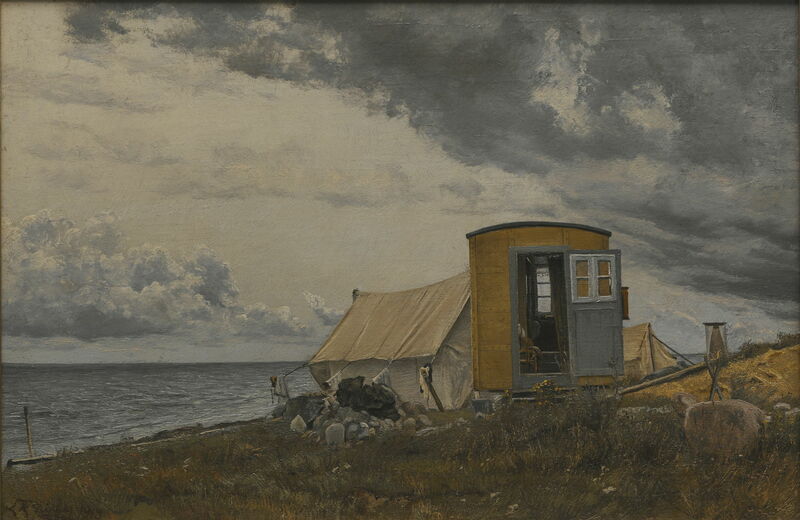 In his View of a Shore with the Artist’s Wagon and Tent at Enö, they are seen on the south-west coast of the island of Enø, near the bridge at Baldersbrønde. They have here spilled out into a tent, whose heavy guy ropes are being used to dry washing. Now not even Sigrid is to be seen. The last painting of Ring’s which I have chosen from this period harks back to his first great success, The Lineman of 1884. Over those thirty years, the railways and towns had changed greatly, as shown in his Waiting for the Train. Level Crossing by Roskilde Highway (1914). The single tracks of the past have been replaced with four tracks, complete with this level crossing. With a train expected at any moment, the barriers have been lowered. Standing waiting to cross the tracks is a cyclist, clearly a working man. It is still winter, and he stands wearing a coat and gloves, looking into the distance for the train. The street at the upper left is in much better condition, broad, and lined with bare pollards. That year, the Ring family moved west from the old schoolhouse in Baldersbrønde to a property which had been built for them in Roskilde, where they were to remain. Posted in General, Life, Painting and tagged Andersen, Brendekilde, Denmark, Kähler, Millet, naturalism, painting, realism, Ring, van Gogh. Bookmark the permalink.